The scene opens on a tall metal structure and a single figure apparently fixing things. As the audience files in and takes its seats, he carries on – we are irrelevant. All that matters is keeping the lighthouse working and preventing ships from being drawn into the dark land below. The man is Parcival (Derek Frood) and he has been here alone for ten years. Then Teller (Jessica Macdonald) arrives and takes the helm. This is a story about loneliness in its biggest sense – the human race has dispersed throughout the universe and Teller is very much afraid that we truly are alone. However, as she is about to discover, there is one far more frightening possibility – that we are not alone. 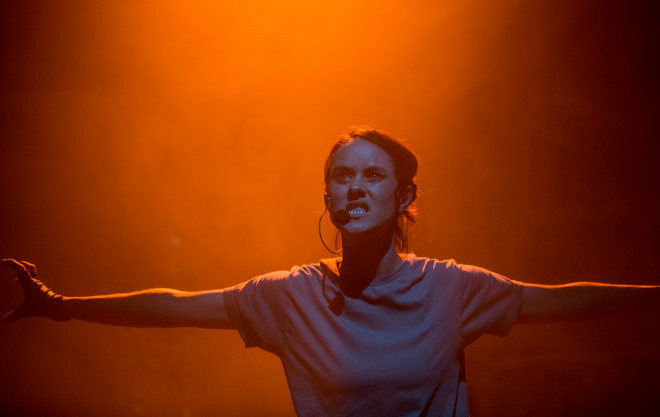 Using footage, haunting lighting, sound and music by North Sea Navigator & Timothy X Atack, and even smell (courtesy of the dry ice), the play is a mastery of suspense and wonder. Jessica Macdonald is compelling as the woman left to keep the lighthouse working, with only a sentient computer, Hypatia (voiced by Laura Dannequin of Hardy Animal) for company. Hypatia is a source of much of the wry comedy in the piece, trying out turns of phrase that seem out of place, but have been harvested from each of the preceding lighthouse keepers. There are times, however, when she also adds a thread of horror, not least when she takes too long answer, and then answers: “Sorry, I was reading a book.” Then fumbles and says, no, that’s not right. She was looking at something and now it’s gone. There’s something deeply chilling about a machine revealing its frailties, particularly when that machine is the only thing standing between you and death. The dark land itself holds its own menacing presence – threatening, unknown and inexplicably enticing. Parcival calls it a siren. Teller gazes into the audience as she stares at the dark land so we get the full power of her awe face-on. Jessica MacDonald is superb – she has us enthralled throughout, drawn in by her passion, her humour, and, towards the end, her raw distress. Derek Frood’s rough-edged Parcival is the perfect balance – the moment when they crouch together muttering about the end of the universe isn’t all easy to follow, but the depth of emotion rings true. We believe in these characters and care about Teller’s fate. More than that, though, you may find yourself considering the stars above you, and wondering what you could overcome and what you would give up for the thrill of travelling among them. 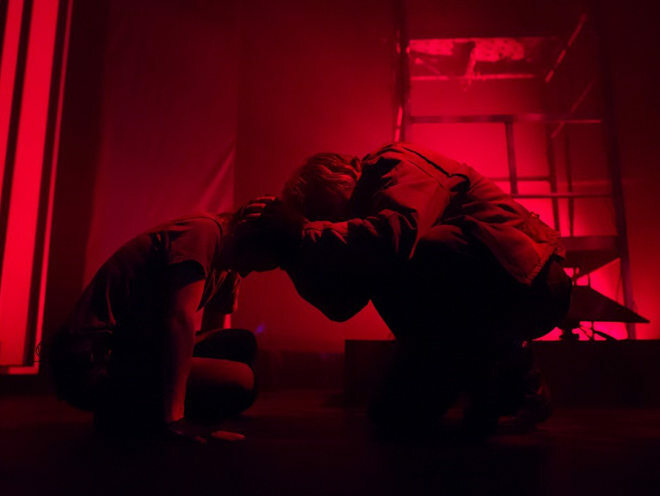 Eerie, thought-provoking, moving, exquisite – Dark Land Light House is a reminder of all that theatre can achieve, when done well and with a dauntless imagination. 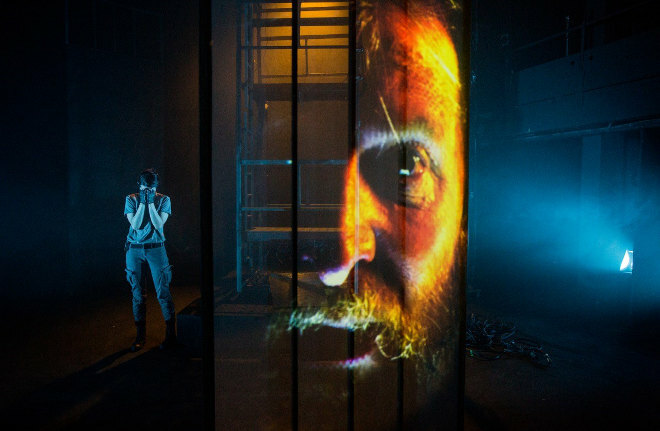 Dark Land Light House is on at Bristol Old Vic Theatre until 30th April 2016. To book tickets, visit www.bristololdvic.org.uk/darkland.html. Presented by Sleepdogs, it’s produced by MAYK and is a Jerwood Charitable Foundation & Bristol Old Vic Ferment Commission. 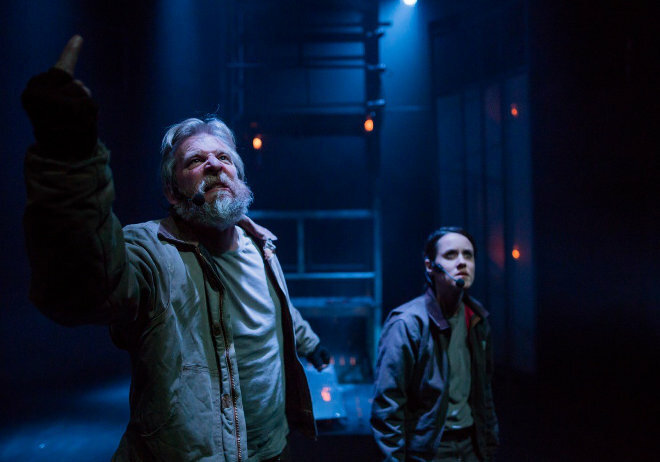 This entry was posted in Reviews and tagged Bristol Old Vic, dark land light house, theatre reviews by Judy. Bookmark the permalink.